Rumours are spreading throughout Alfheim Online of a duelist stronger than any other defeating all challengers in a series of one-on-one duels. Eager to confront the duelist for herself, Asuna Yuuki gets a little more than she bargained for in getting roped into the adventure of a lifetime. Kirito and Sinon have defeated Death Gun and returned victoriously from Gun Gale Online to Alfheim Online to continue playing the game in peace. Meanwhile, things haven’t gone so well for Asuna Yuuki with pressure coming from her emotionally distant mother to begin taking her future seriously beginning to mount. Mere weeks later, a new duelist, dubbed “The Absolute Sword”, is defeating all challengers, prompting Asuna to seek them out for a duel of her own. In return, she receives an invitation to join a special guild to help them defeat a floor boss all on their own to make their eternal mark on ALO. Click below for a better reading experience and more light novel reviews! 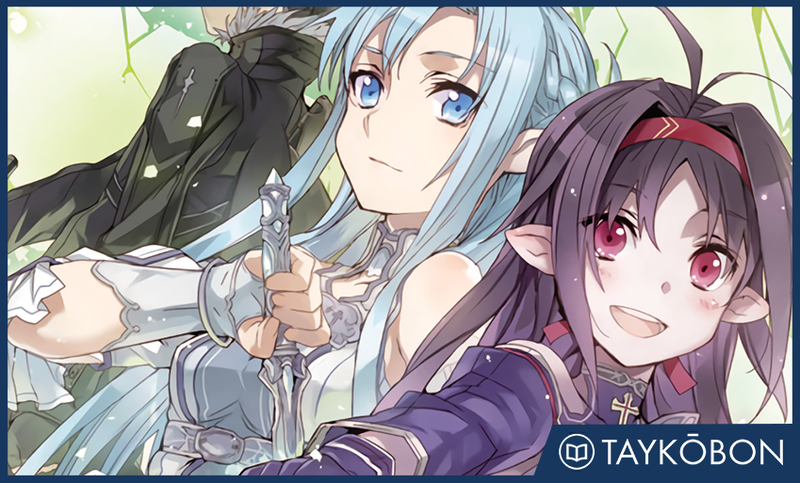 After six volumes following the adventures of Kirito, Sword Art Online Vol. 7 (“Mother’s Rosary”) switches things up significantly by making Asuna the star of the story as she goes on an adventure of her own. This immediately give the story a very different sort of flavour in exploring her perspective, and allowing us to see the world through her lens was quite compelling in terms of exploring a different person’s view of Alfheim Online and virtual reality in general. Much to my enjoyment, Asuna made for an engaging protagonist because of the way that we immediately get a sense of her personality coming through in her observations of the world. This served to differentiate this volume very well from the legion of other light novels which star sparsely characterized or emotionally bland protagonists who are little more than stand-ins for the reader in the worst sense. This allowed this volume to tackle some very different story beats with Asuna as the star, immediately grabbing my attention right from the start. Utilizing a different type of protagonist as a lens for the reader would mean much less if this did not complement the story effectively, but thankfully Mother’s Rosary delivers a compelling story which takes the best elements of Sword Art Online’s virtual reality setting to explore some very tangible and grounded emotional themes in a satisfying manner. A running focus of this series has been exploring the effect that virtual reality and online games have on the lives and psyche of real people, and this is continued very strongly in Asuna’s tale in this volume. This is explored well in this volume’s two plotlines - the first following Asuna as she takes on The Absolute Sword, and the second concerning Asuna’s rocky relationship with her overbearing mother who is opposed to Asuna spending time in virtual reality. This interplay between virtual reality and the real self connects these two strands together strongly, and the character development that Asuna experiences over the course of this story feels well-earned as a result. Mother’s Rosary’s main plotline follows Asuna first as she takes on The Absolute Sword, and later as she joins Yuuki Konno’s guild The Sleeping Knights in their quest to defeat one of New Aincrad’s floor bosses. This turns into a very fun adventure which has some excellent battle scenes, and I enjoyed Asuna’s duel with The Absolute Sword greatly because of how clearly described it was in conveying the speed and ferocity of the proceedings. A later battle between the Sleeping Knights and a group of rival players is similarly well-described, and I liked that this incorporated the factionalism of Alfheim Online into the story in a way that complemented the overall plot without bogging the story down at all. The focus on Asuna also pays dividends here in differentiating these battles enjoyably from others in the series, and I really liked seeing them from her more tactical perspective. This quest culminates in a final battle which perfectly captures the fun and sense of adventure experienced by these players while underlining the emotional stakes at hand effectively and in line with the rest of the story. Perhaps what makes this volume stand out the most is the sense of heart that it conveys all throughout. We get a very real sense of the charming friendship between Asuna and Yuuki throughout this volume thanks to their exploits in battle, and it was wonderful to see the effect this had on growing Asuna as a character in terms of her relationship with her mother. This gave this volume a thematically cohesive feel that was well appreciated in terms of getting across the emotional as the volume moves towards an appropriately earned emotional conclusion. The emotional beats here are well-struck, never feeling gratuitous while complementing this series’ themes effectively. Although this volume isn’t perfect in the sense that some of the medical aspects don’t feel like they are quite explained well enough to hold up completely, Kawahara accomplishes his goal of exploring the connection between the virtual and the real completely in this volume through the story of Asuna and Yuuki. Sword Art Online Vol. 7: Mother’s Rosary tells an impactful story that utilizes the series’ emphasis on virtual reality to engage with both its characters as well as some heartwrenching emotional themes in a satisfying manner. This is perhaps the most complete book in the series in terms of telling a well-paced, fun, and emotionally affective self-contained story, and I thought that it really brought out this series’ best elements in a wonderful way. It’s amazing that a small story about friendship can feel more emotionally affective than the numerous grand stories of saving the world have felt, and Mother’s Rosary should definitely be on the reading list even for those who are not otherwise interested in the series. Sword Art Online Vol. 7: Mother’s Rosary was published by Yen Press on April 19th, 2016. Authored by Reki Kawahara and illustrated by ABEC the series is currently ongoing and published by ASCII Mediaworks’ Dengeki Bunko imprint. The series has received a two season anime adaption and volume 8 will be published in English on August 23rd, 2016.